Catfish and Cornbread: It might still be 10 to 9 in Texas, but it's 4 to 2 in Tulsa. It might still be 10 to 9 in Texas, but it's 4 to 2 in Tulsa. Georgia wins the 2008 NCAA Tennis National Title over Texas 4-2 in Tulsa, Oklahoma. After dropping the doubles point and the first singles point to trail Texas 2-0, the Dawgs stormed back to win 4 straight points for the win and Back-to-Back National Titles. Nate Schnugg and Jamie Hunt started the comeback with dominating victories at the no.2 and no.4 singles spots. 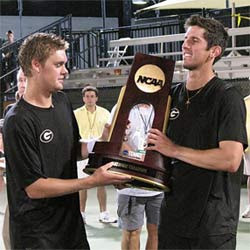 If the two sophmores stay all 4 years, they will have the chance to go down as two of the most decorated Bulldogs in Georgia's storied tennis history. With 3 matches to go the Dawgs needed to win 2 of the 3 remaining singles. Seniors Luis Flores at no.3 and Texas transfer Travis Helgeson at no.1 closed the deal for the nations first repeat National Champion since the Stanford run from 95-98. Congratulations to Coach Manny Diaz who has now won the National Title in 1999, 2001, 2007 and 2008. Georgia's other two titles were in 1985 and 1987 under the legendary Coach Dan Magill.